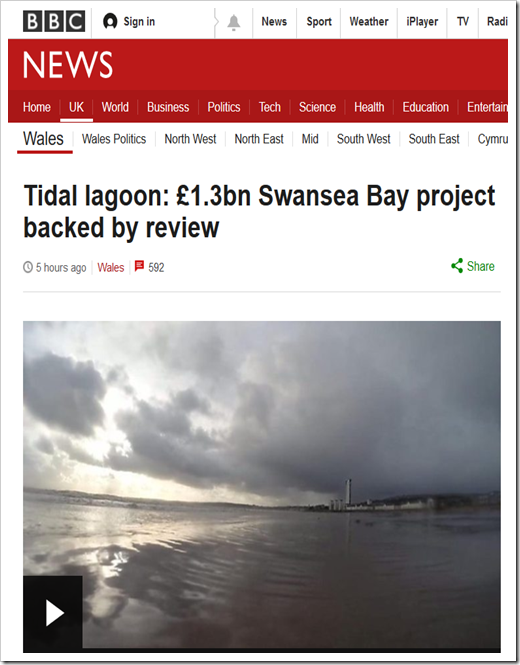 With Swansea Bay tidal lagoon back in the news again, it is worth revisiting my post from last year, which took a close look at the Hendry Report. As expected, Charles Hendry’s supposedly independent review has come out in favour of the Swansea Bay tidal lagoon project. Charles Hendry’s independent report into the technology’s viability said it would make a "strong contribution" to the UK’s energy supply. Mr Hendry said: "If you look at the cost spread out over the entire lifetime – 120 years for the project – it comes out at about 30p per household for the next 30 years. That’s less than a pint of milk. "That’s where I think we can start a new industry and we can do it at an affordable cost to consumers." The "fleet" includes one off the coast of Cardiff – east of where Cardiff Bay is now – Newport, Bridgwater Bay in Somerset, Colwyn Bay and west Cumbria, north of Workington. 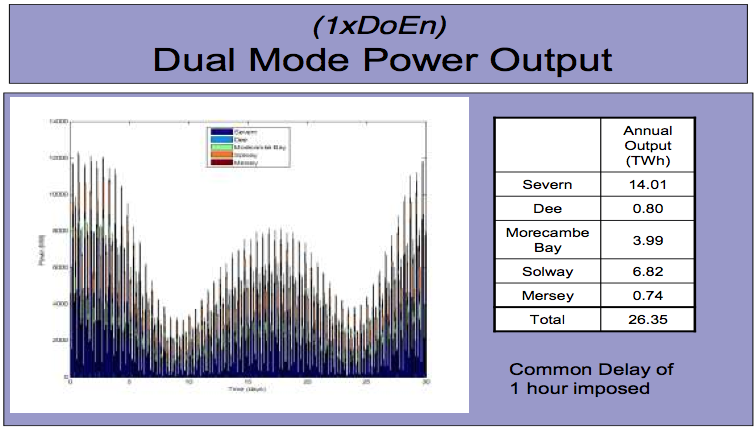 1) According to the Tidal Lagoon Power website, Swansea Bay will produce 530 GWh per year. This is a tiny 0.15% of the UK’s electricity generation. As a percentage of the UK’s overall energy needs, it will be less than half of this. 2) The capital cost is estimated at £1.3bn. 3) They also estimate that they can generate power for 14 hours a day, split into four spells. Whilst tides are predictable, back up power would still need to be provided for the rest of the time. 4) In comparison, the 2000MW CCGT plant down the road in Pembroke is capable of generating 15 TWh a year, 28 times as much, when and as needed. 5) Hendry claims it would "contribute positively" towards the UK’s decarbonisation goals. This is a nonsense. TLP’s own figures give annual “carbon” savings of 236,000 tonnes. UK total emissions are around 440 million tonnes, so Swansea will save about 0.05%, equivalent to 4 hours worth of emissions every year. 6) The usual claim about the “number of homes” that can be supplied is wheeled out, this time 155,000. This conveniently ignore demand from non domestic sources, which accounts for two thirds of the total. The generation from Swansea will be so tiny that it would supply the UK for just 13 hours each year. 7) It is claimed that the subsidy cost will amount to 30p per household a year. This is, of course, a tiny amount, but for the simple reason that the output is equally tiny. No details of strike prices are given , because they are a matter for negotiation. However, TLP have previously indicated a starting price of about £120/MWh. Over the period of the contract, because this price is only partially index linked, it is suggested it will average around the price of Hinkley – £92.50/MWh at 2012 prices, but about £100/MWh at current prices. This would mean a subsidy of about £32 million a year. This would equate to £206 a year for the poor suckers who live in those 155,000 houses! 8) In addition, there is the cost of providing back up capacity for the 10 hours every day when no power is being produced. 9) The Hendry report does not appear to have considered any environmental issues, judging at least from the reporting of it. We have already heard from the RSPB about their concerns for birds. Local fishermen are also extremely concerned about the potential effect on fish stocks, if local eco systems are thrown out of balance. 10) Less widely reported have been the environmental considerations at the Dean Quarry in Cornwall, which is designated to supply the rock for Swansea. 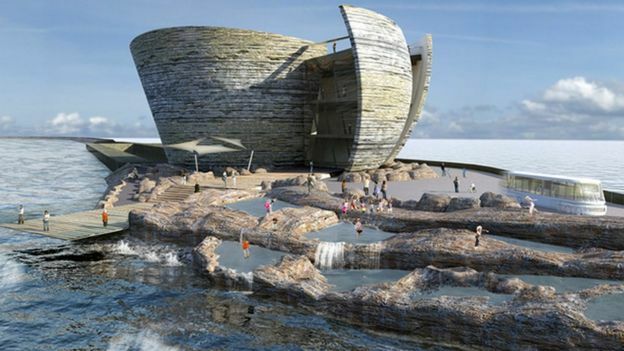 Dean Quarry will be developed by Shire Oak Quarries Ltd, a subsidiary of Shire Oak Energy, whose chief executive Mark Shorrock is also head of Tidal Lagoon Power (TLP). The area of Cornish coast where the jetties are planned has recently been designated a Marine Conservation Zone, where rare marine flora and fauna are supposed to be protected. Understandably, locals are also furious about the impact of major quarrying operations on their lives. Hendry claims that the lagoon will create jobs, but, as we have seen before, subsidies taken from Peter to pay Paul simply take money out of the rest of the economy. Unfortunately, however, while we are lumbered with the Climate Change Act there are not many alternatives to Swansea. Even more expensive offshore wind power or more Hinkley Points are hardly any more attractive. No government decision has yet been made, and we can only hope that common sense prevails. I wonder how long it would take to offset the CO2 used to build the thing? After construction is complete, I don’t see any reason to expect more jobs in the vicinity of the lagoon, beyond the very few needed to operate the plant. And most of those jobs will go to people from outside the area brought in because they possess relevant skills. How many jobs are created in the vicinity of conventional power stations? I would suggest the same as I do for the proposed lagoon- the power gets fed into the grid and taken to places where there is a need. Nobody re-locates in order to be next to a power station. Why don’t we surrender our pensions, right now, and throw them into Swansea Bay? We know that is where they are headed – or somewhere equally daft – whatever we say. I started watching the select committee hearing but had to switch it off. I really find it hard to feel anything other than utter contempt for these shameless conmen who rip off the public purse so smoothly. Despite the concept of harnessing tidal energy from lagoons being ancient and the technology for the turbines and generators being developed in principle from other forms of hydro power, this is still essentially a new technology. The strike price of solar or wind power when they were a new technology was far from as favourable as it is today, as a result of the technology being more developed. To compare a new technology to developed is a little misleading. With regards to the scale of generation, yes this represents a small amount of power which is useless in isolation due to the periodicity of tides. This is a proof of concept, however, and not the actual solution proposed by tidal lagoon power. The range of tides around the country allow the peaks of generation to be smoothed with a number of lagoons. The reason to build one fairly insignificant one is to test the concept and be able to weigh up the final solution from an informed and balanced position, with an informed understanding of the actual risks and benefits. I can’t help but think that it is just the sort of risk that is worth taking for something that will produce a predictable amount of power this cleanly. Nonsense. We’ve had low head hydro since the 1880s and La Rance has been operating since the 1960s, and we’ve been building breakwaters for millennia. The only differences between La Rance and Swansea are that La Rance was much lower cost because it didn’t need an extensive barrage, and it dams an estuary, which provides some river flow to reduce the problems with silting. There’s also Lake Sihwa in Korea that is a similar scale project that has been operating for a decade. There is nothing novel about Swansea. Adding in the Thames doesn’t help. Besides, we get spring tides and neap tides everywhere in accordance with the orbit of the moon. Thanks for the link. I’m no authority on these (infernal) things but it seems to me that they are a kind of yin-yang of destruction – nature destroys them or they wreck havoc on the local marine environment. And I still wonder, do any of the tide-activated contraptions actually work for any length of time? Please also note the effect of the Rance turbine project in France St Malo. Decommissioned after 50 years it has silted so badly that it has destroyed the ecosystem completely, the destruction having ruined the rivers for miles inland from the turbines.